True. Yet extensions could still go East someday. 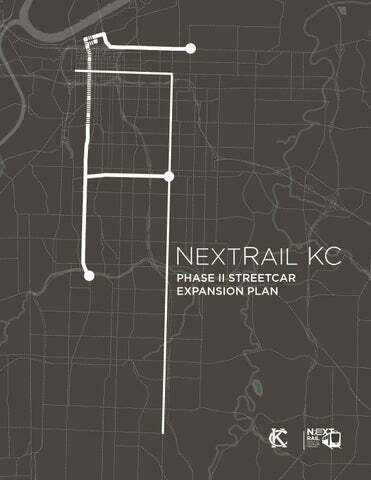 NextRail KC still has Independence and Linwood as viable options when the time emerges. They include Prospect Max in the map below too. The streetcar is free and the ridership is based on a couple months of good weather during tourist season and you're going to have people jumping on and off repeatedly, tourists checking it out etc. Yep, it will be interesting to see what happens to ridership when the weather gets cold. The comments I see on other forums are not nearly as positive as they are here, and those are comments from not only suburban residents but also people who live in urban KCMO. What light rail have you watched struggle in Chicago? Mostly service to the western part of Chicago due to low ridership. Those cuts were made 10+ years ago. In general though it has been great and I'm a big proponent of Light rail in general I just keep hearing how wonderful it will be in KC and when I start talking about cost, fees, ridership....you know basic economic sustainability it starts to look *bad*. I mean here we have people so desperate to push it that they are trying to compare FREE trolly car rides downtown to a big light-rail expansion. Again, this is coming from someone that is pro light-rail and has no financial incentive either way that it should occur. Tell you what, anyone really wanting to push this, then lay out the approximate population density and employment hubs along a proposed route and compare to pop density in other places. If you haven't done this and haven't seen anyone do this but just really *like* light rail then you haven't done your homework. Basically, you don't want to end up like Amtrak. I love the streetcars, I honestly would love to see them succeed. I think initially I was more thinking busses but they have a nice flavor so I think I was wrong but then it's not my tax dollars paying for the free rides. Bottom line, make it a buck a ride and watch the ridership do what exactly? My guess is that people would still pay, it's just a dollar. But it would be interesting to watch and if you're serious about light rail maybe it would be a quick test? I'm confused, because I lived in Chicago in the late nineties/early 2000s, and again in 2013-2014. Most of my family lives in Chicago, I've been either living there or visiting frequently since the late 1990s, and to the best of my knowledge, there is ZERO light rail in Chicago. Metra isn't light rail and neither is the L. The CTA uses no light rail on any of its transit lines, and the Metra uses heavy rail. The L has record ridership, and the only CTA transportation that's experiencing a ridership decrease is the bus branch. Very little service has been cut in any branches of the L in a very long time, and in fact, ridership is up. The western side of the city is serviced mostly by the Blue and Green lines, and the Green line lost, I think, six stations in the mid-90s, but that's still pretty small potatoes, given the huge numbers of ridership of the system overall. It's the third busiest train transit system in the country. You can't compare KC's streetcar to Chicago. Chicago doesn't even have light rail or streetcars, they have METRA heavy commuter rail and CTA heavy EL/Subway. Other than having track, there is almost nothing in common between those types of systems and what is essentially an urban trolley or local people mover in KC. One of my Harvard '76 classmates worked for the Chicago Transit Authority. It was what he knew he wanted to do even before he entered college. As has been pointed out already, the CTA network is "heavy rail" rapid transit, not light rail. Chicago's streetcar system had disappeared completely by the late 1950s - around the time Kansas City's last streetcar line (the Country Club line) ceased operation (that was 1957, the year before I was born). I haven't heard that the CTA has eliminated service on any of its extant 'L' lines; in fact, it added a new route (the Pink Line) that takes advantage of some north-south trackage on the inner West Side that hadn't been used for revenue service in some time. Amtrak exists because (1) the private railroads couldn't operate passenger service profitably - and (dirty little secret) hadn't been able to do so for decades prior to its creation in 1971 (2) the American public wasn't about to accept the total elimination of passenger rail service - and by and large still isn't, despite the fact that it doesn't operate at a profit anywhere outside the Northeast Corridor. BTW, nor does urban rail transit anywhere other than in Singapore and Hong Kong. In the latter, one of the revenue streams comes from rents from property the mass transit company owns atop its stations and storage yards. Now I think I understand what the complaint was on the East Side. Prospect Avenue is the East Side's Main Street. Bruce Watkins Drive sapped the life out of it. The two recommended east-west extensions would have gotten you TO Prospect Avenue. Neither of them would have taken you DOWN it. I remember taking the Prospect Avenue bus downtown as a kid. It remained a key part of my transit use growing up, along with the 39th Street crosstown bus to the Plaza. Without having seen the anti-expansion propaganda, I'd be willing to wager that the main complaint ran something along the lines of, "We're going to be taxed for streetcars that aren't going to go where we want to go" - namely, along Prospect. I think the city as a whole SHOULD have an interest in reviving Prospect Avenue. Since the only transportation tool being offered towards that end is Prospect MAX, then everyone's all in for that. Were I actually still living in Oak Park, I'd be agitating for a north-south Prospect Avenue streetcar too. A fellow I know who's involved in the KCRTA (the subject of my column in this month's 435) told me that there was actually more support for expanding the taxing district on the East Side than one might believe from the results, but the anti forces were more motivated and better mobilized. Prospect Avenue's omission may have helped with that mobilization. 1) It's not going to be financially sustainable anyway. Every mass transit system is subsidized by the government. 2) It's worth more to the city to have a popular Streetcar, with people jumping on and off all the time, going new places and seeing new things around downtown, than to have revenue from fares, along with reduced ridership. There are valid arguments for subsidy as it helps reduce congestion and benefits even the non-riders....cuts pollution and so on and so forth. I was just musing that making people pay really does start to change the game and found it a little *loose* to point to the streetcar free ridership as proof that light rail makes sense.